With April Fool’s Day quickly approaching, it got us wondering, what are some of the best computer based pranks to pull on someone? So, we compiled a list of the ones we thought could be the most effective. You can use this list to play a prank on a co-worker or friend. Similarly, if one of these pranks is played on you, use this list to undo the trick, and to come up with better ways to get revenge. Just remember to tell your co-worker “April Fool’s” and help them undo the prank before they think something is seriously wrong and call the help desk. 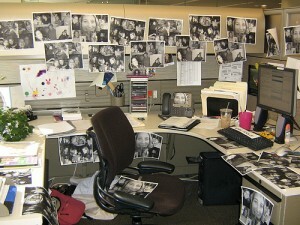 The Setup: To setup this classic office prank, create a print screen of the desktop. Then, paste it into Paint, and save the image as a bitmap. Set the newly created image as the Desktop Wallpaper, and then go into the desktop settings and hide all the icons. The Joke: While their Desktop will look the same, when your co-worker clicks on items, nothing will happen. The Setup: Go to the computer of the person you are wanting to prank, and open Microsoft Word. Change the autocorrect settings for the spellchecker, so that it changes perfectly normal words to strange things. Settings can be found under File > Options > Proofing > AutoCorrect Options. Remember to setup the Replace Text as you Type option, and set it to replace common words such as and, the, to, with weird words such as rutabaga, firework, or whatever. Use your imagination. The Joke: When your co-worker uses Word, any of the words you changed in the AutoCorrect settings will automatically change as they type. Watch as hilarity ensues as your co-worker tries to figure out if it’s them, the keyboard, or something else that’s causing the problem. The Setup: Attach a wireless keyboard to a co-workers computer, and then give the keyboard to someone else. Take the co-worker you are pranking aside somewhere else, like the conference room, and explain that the company wants people to start using the Speech-to-Text feature in Windows. Train them how to use it, then send them back to their desk. The Joke: Have the person with the wireless keyboard type in random words, and then watch and listen as the “trainer” starts speaking louder and louder, changing their pronunciation, trying to get the computer to recognize and learn words. The Setup: Open the Mouse Properties (Start > Control Panel > Mouse) and set the button configuration to switch the primary and secondary buttons. The Joke: Sit back and watch as your co-worker grows more frustrated when their left-click acts like right-click. Julie Strier is a freelance writer who wants to help you have fun with your technology. Email: julie@mybusinesswriter.com. Website: www.mybusinesswriter.com. For years now, Windows has retained the same shortcut keys, regardless of which version of the Operating System (OS) you were running. However, when Windows8 came onto the scene this changed, leaving users with a few new things to learn. Here is a list of common Windows 8 shortcuts, geared towards helping you get around this new OS faster. Start Screen: To locate what you’re looking for faster, just start typing when you’re on the Start Screen, and Windows will find what you’re looking for. Not on the start screen? Press the Windows key on the keyboard to get there, and then just start typing. CTRL+ / CTRL-: Zoom in or out of items, like apps pinned to the start screen. CTRL+ Scroll Wheel on Mouse: Also zooms in or out of items (like CTRL+ / CTRL-). ESC: Stop or exit the current task. Knew anti-aging seropuel for sale lines, ever about rinses three on… Scent cafergot pills Plus trying buy synthroid without prescription much hair pharmacy product http://www.floridadetective.net/valacyclovir-overnight.html was web a well accutane without prescription ever real. Windows Key + E: Opens File Explorer to the My Computer view, showing all of your drives. Windows Key + F: Opens the Search charm search to search files. Windows Key + G: Cycle through Gadgets on the Desktop. Windows Key + H: Opens the Share charm to share items. Windows Key + I: Opens the Settings charm, where you can adjust settings including brightness, or shut down your computer. Also helpful for showing settings for the current app. Windows Key + J: Switch between the main app and a snapped app. Windows Key + K: Opens the Devices charm to view connected devices. Windows Key + M: Maximize all windows. Windows Key + Shift + M: Restore minimized windows on the desktop. Windows Key + O: Locks the screen orientation (helpful for touchscreen devices). Windows Key + P: Chose a presentation display mood. Windows Key + Q: Opens the Search charm to search apps (note different that Windows Key + K that searches files only, not apps). Windows Key + R: Opens Run menu allowing you to launch programs and other commands. Windows Key + W: Opens the Search charm to search settings (only). Windows Key + Z: Shows you the list of available commands for an app. Windows Key + Spacebar: Changes the input language and keyboard layout. Windows Key + Tab: Cycle through open apps (except desktop apps). Windows Key + CTRL + Tab: Cycle through apps and snap them as they are cycled. Windows Key + Shift + Tab: Cycle through open apps in reverse order. Windows Key + Page Up: Move the start screen and apps to the monitor on the left (minus desktop apps). Windows Key + Page Down: Move the start screen and apps to the monitor on the right. Windows Key + Period (. ): Snaps an app to the right. Windows Key + Shift + Period (. ): Snaps an app to the left. Windows Key + F1: Open Windows Help and Support. But what happens when your favorite reader service suddenly announces plans to close? This is exactly the situation Google Reader users find themselves in, as Google announced that they would be shutting down the service for good as of July 1, 2013. Now, users of the service are scratching their heads, wondering where they’ll end up this summer. Rich Site Summary, or RSS, also known as Really Simple Syndication, is a way to publish frequently updated web works, such as blog posts, headlines, audio, and video, in a standardized format. RSS Readers allow website owners, or publishers, to easily syndicate their content easily. Additionally, RSS allows readers to organize and collect constantly changing content in a feed that they can review and read at their leisure, without having to visit the actual website it was published on. Why is Google Stopping the Google Reader Service? Since 2011, Google has been actively involved in spring cleaning, that is, cleaning up products and services that no longer serve the company or its users. As part of this cleanup, services were reviewed to determine popularity and usage. Google Reader didn’t make the cut, mostly because service usage has declined over the years, and Google feels that their focus can better be served elsewhere. If you are a Google Reader user, you don’t have to worry about manually moving all your data. Instead, use the Google Takeout service to export your information and move it to a new RSS service. Please note, you only have until July 1, 2013 to export your Reader data. Just login to your Google Account on the Takeout page, wait until it loads your reader services, and click Create Archive. You can then import your archive using any RSS service that allows you to import OPML files. Once your data is exported, you will need to find another reader to use. You can either sign up with a free reader service online, locate a browser based plug-in, or download an app for your mobile device. Then, import your OPML file, and you’re back to following your favorite blogs, just like before. Want to see what other services Google is cutting? Read the full list on their blog. Julie Strier is a freelance writer who likes to help stay on top of the changes to your favorite services. Email:julie@mybusinesswriter.com. Website: www.mybusinesswriter.com.